Sometimes a faulty garbage disposal only needs a nudge to get back up and running. Before you call in the pros, try these five troubleshooting tips. Q. After dinner, I rinsed off the dishes in the sink like I always do, and then I flipped on the garbage disposal switch to grind the food scraps. Nothing happened. Should I start shopping for a new disposal? Or, is there a way to fix the one? A. Garbage disposal not working? Well, while there’s a slim chance that you might have to replace your disposal, it’s unlikely. Odds are that the problem is something you can fix, often in just a few minutes. 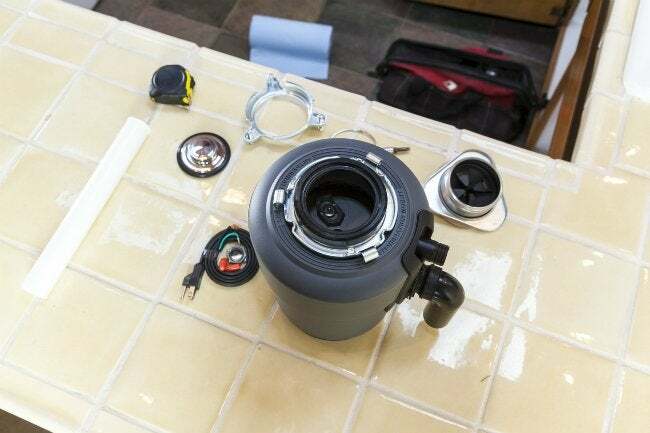 Proceed with the following DIY troubleshooting tips to get your garbage disposal back up and running. Start with a power check. Whenever an appliance like a garbage disposal is not working, the first thing to do is to check is whether it’s still plugged in. While this step might sound overly simplistic, think about the under-sink area in your home: If you store cleaners or a wastebasket under your sink, the garbage disposal plug can easily get knocked loose or pushed out of the outlet. Plug it in, and you’re back in business! Or, the fix could be as simple as pressing the reset button. If the disposal cord is securely plugged in, try the reset button next. You can typically find it on the side or the bottom of the under-sink part of the garbage disposal, depending on the model. You may even have to feel around the back of the unit to locate it. When you find it, press it once—firmly—and release. Overloading the garbage disposal with food scraps can cause it to overheat and trip the reset button. If you hear a hum coming from the disposal, something could be jamming the grinding plates. Make sure the switch is off and unplug the garbage disposal from the outlet before you attempt to remove the jam. After you’re sure there is zero power to the unit, reach into the garbage disposal and feel around for a small object that could be jamming the plates—forks, spoons, rings, and other small non-food items are common culprits. Most blockages can be removed by hand, but all is not lost if you can’t wiggle it free on your first try. On the bottom of the garbage disposal, in the very center, is a small depression that receives a ¼-inch hex-head wrench or a ¼-inch hex-head key. Fit the key or wrench in the depression and twist it back and forth firmly to rotate the grinding plates and free the stuck item. Too many appliances might be drawing power from the electrical circuit. In newer homes, local building codes typically require the electrician to run a single circuit for the garbage disposal and the dishwasher to share. In homes where additional outlets are on the same circuit, however, running the garbage disposal while something else is operating—such as a toaster or countertop griddle—could cause the breaker to trip. Before you locate the tripped breaker in your home’s main electrical panel to flip it back on, test how many other outlets in the kitchen still have power. Plug something small, like a desk lamp, into any other outlets available in the kitchen; if additional outlets have no power, it’s likely that too many outlets are on the same circuit. 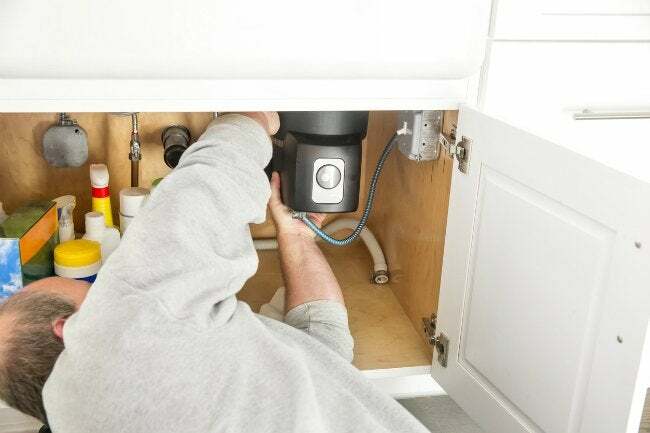 A simple workaround is to run the disposal only when no other appliance is going, but a more permanent fix would require an electrician to run one or more additional circuits in order to prevent overloading the one that powers the garbage disposal. If the garbage disposal still won’t work after exhausting all your options, it might be time to consider a replacement. While the above steps will fix most garbage disposals, they won’t fix blown motors or factory defects. Contact the manufacturer if the disposal is relatively new to find out if a replacement could be covered by warranty. Treat your garbage disposal with care to ensure a long useful life. 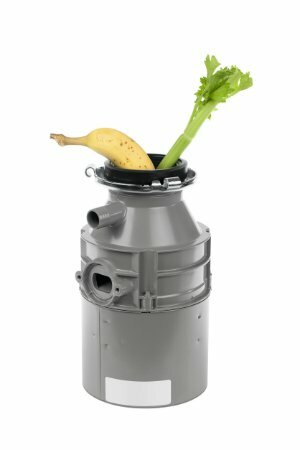 So that you don’t run into a garbage disposal malfunction in the future, remember this: It works wonders grinding up soft bits of food that remain in the sink after meal preparation, but it’s not designed to chew through chunks of fibrous food scraps, like raw celery, carrots, or cabbage. Put the bulk of your food scraps in the trashcan, or better yet—if they’re non-meat scraps—the compost pile. Always run the garbage disposal with plenty of cold water and allow the unit to run a few seconds after the food grinding is complete to clear away residual bits of food that can cause odors.